This has been probably the most interesting week of the year for my ridiculous Dylan blogging project. 1997. I would not have guessed that. It’s been four weeks since there has been a new Dylan album (not counting the live MTV Unplugged or Greatest Hits compilations). It has been seven weeks since we have heard new songs from him. It was seven years in real time. Then, suddenly, Time Out of Mind, his most heralded recording since at least Blood on the Tracks. Despite the fact that it won the Grammy for Album of the Year in 1998, and for best male vocal performance (“Cold Irons Bound”), I had never listened to this album before this week. Never. I knew a few of the songs (“Love Sick”, “Cold Irons Bound”. “Tryin’ to Get to Heaven”) but I never bought this album, and had just never heard it at all. I listened to it for the first time last Sunday on a bike ride and I didn’t really like it. My initial reaction was that it all sounded too much the same – rhythms and tempos were all pretty similar, and it had a layer of Daniel Lanois-esque production on top of it. I was disappointed. It didn’t live up to the hype. Listening to it for a second time that night I thought it was better than my initial listen but only a bit. On Monday morning it got a bit better. Monday afternoon, riding home from work in the midst of a summer blizzard (hey, that’s life in the mountains), it started to sound good to me. It was that night that my reaction shifted gears. This is Dylan’s longest album since Self-Portrait, and only his third double album (on vinyl, it’s a single CD). One of the effects of that is that I didn’t always listen to the whole thing all the way through in one sitting. At almost 73 minutes long, if I turned it on at lunch in my office I would generally turn it off at almost an hour. I think that the first four times that I deliberately sat down to hear the album I turned it off at the end of “Can’t Wait”. I think it was Tuesday before I actually listened to the last song, “Highlands”, and then this whole thing made sense. I knew that we were in some pretty special territory. “Highlands” is 864 words long. In comparison, “Brownsville Girl” is 1117 and “Desolation Row” is a mere 660. It’s an epic. Funnily, I do think that I will tire of “Highlands” more quickly than the other two epics. I still like “Desolation Row” and I absolutely adore “Brownville Girl”. The revelations of “Highlands” seem smaller and more intimate and may fade over time, but I’ve loved this song this week. 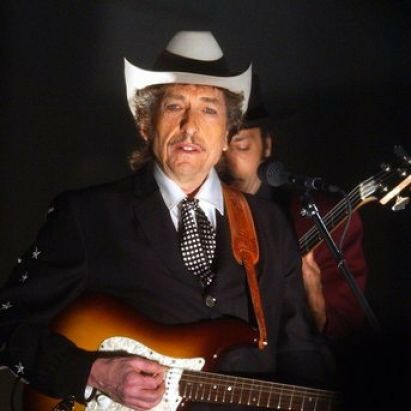 Dylan has played it nine times in concert (mostly in 1999 and 2001) and I’ll be curious to hear that – there is a lot of room in this song for extended improvisation and lyrical changes. Okay, so the rest of this album. In general, of the eleven songs, I like ten of them. Actually, I even like the one that I don’t like, but I just don’t think it fits thematically on this album. Almost everything is long – six songs longer than five and a half minutes, three longer than seven minutes. This is an epic’s epic. 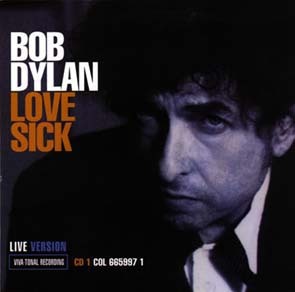 The opening track, “Love Sick”, which was also the second single from the album, really does set the agenda for the whole album to come. Moody, atmospheric, Lanois-esque, the whole thing driven by the sounds of the organ and Dylan’s razor-like voice with the those cutting occasional guitar chords (one of the least guitar-driven songs Dylan has ever recorded). The organ playing recalls Ray Manzarek of The Doors at times, while Dylan is moving towards Tom Waits as a vocal stylist. Dylan was 56 when he recorded this plaintive wail of a song. It is typically dark and anti-love, but, of course, ends with the sort of sad admission: “I don’t know what to do/I don’t anything to be with you”. The White Stripes covered this one. Great song. “Dirt Road Blues”, the second song, is the only one that I don’t really like. It’s not that it’s a bad song – it’s perfectly fine – but it just seems out of place. Generic. You could put this song on so many Dylan albums after Blonde on Blonde and it would feel absolutely like it belonged there. Put it on Nashville Skyline and you’d think “Yup, that fits”. Same with Under the Red Sky. There is a continuity here of Dylan’s interests that makes it undeniably Dylan-esque. But it doesn’t really add anything here. It’s a change of pace song that arrives too early – the pace hasn’t been set yet. Funnily, when I was first listening to this album my complaints were that it was all too much the same in terms of tempos and keys, but by the end of the week it was the one song that varies those things that I liked least. Go figure. Also, I don’t like the crude way that Lanois fades this one out. There are a couple of hackneyed fade outs on this album (probably to keep it to the length of one CD – they really move up to the boundary on this album – but it bothers me). 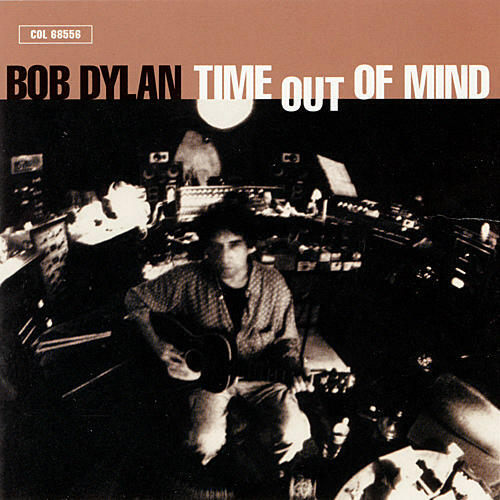 I think this has the best musicianship on the album and some of Dylan’s best singing here too. The vocals are really full and up front. Lovely. “Million Miles” is near the bottom for me on this album. The jazz parts just seem too self-consciously jazzy – the drum flourishes and vamping of the organ are almost parodies of jazz stylings. This is one of those pieces where I think that the song itself is better than the recording of it on this album. Probably would fall into the ten spot out of eleven songs. Let’s move on. Not a whole lot to see here. It’s the Sugar Town/sugar down rhyme that gets me every time, particularly the way that Dylan speeds his way through it. I love this one. “Til I Fell In Love With You”. I hate to keep harping on this, but to the people who want to say that this is a post-Christian Dylan: “I know God is my shield and he won’t lead me astray”. Seriously, people. This is another pretty good song. This one sounds like it could have gone on Oh Mercy, the previous collaboration with Lanois. Another one with a slow tempo, but it has a little bit of funk to it. A pretty strong argument can be made for “Not Dark Yet” as the best song on this album, and one of his best in two decades at least. This is one of his best expressions of Christian faith (it was used on the soundtrack for The Passion of the Christ (which was a collection of songs that weren’t used in the Mel Gibson movie)). Whatever one might want to say about Lanois, the production on this is just exemplary. 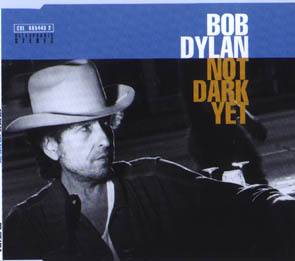 Every single time Dylan sings the refrain, “It’s not dark yet, but it’s getting there”, it gets to me. This one is a mini-masterpiece. Dylan won a Grammy for singing “Cold Irons Bound”. Seriously, a singing Grammy (again!). It’s another strong contender for best song on this album. Another dying love song, with biting guitar. The vocals are interesting – they seem a little distant, as if they were echoing forward from somewhere else, though there isn’t anything so obvious as an echo effect. Like “Love Sick”, this is a dark, moody, haunting song with a touch of bitterness to it. The central image from the title “twenty miles out of town in cold irons bound” is tremendous – that little shift in the word order makes the phrase seem slightly alien. I always find it a tiny tongue-twister – the plural of irons get me every time. Dylan has used every song (but “Highlands”) on this album in his live sets, but this is up there at the top – more than 400 performances. It is truly a mature rock song. “Make You Feel My Love” is near the bottom of my list for songs on this album, and some critics dismiss it outright. I’m going to write a separate post about this one later today. “Can’t Wait”, the penultimate song, is one of the thinner ones. This one probably falls into the “fine” category. It would seem better if the rest of the album wasn’t so much better than it is – I think it is only minor in comparison. So, Time Out of Mind. Incredible album. This is the kind of mature, late-50s, been all around the world, lived, loved and lost, found God, lost my talent, found it again album that only someone like Dylan probably could have written. Remarkable album. Dylan apparently isn’t that fond of it as an album, having problems with the Lanois sound (notably he has produced all of his own albums since this one), and though it does at times sound like a Lanois album, that’s not really that bad a thing. It’s funny, I haven’t been that down on Dylan for the past few weeks. I really thoroughly enjoyed his 1995, and even though 1996 seemed to be a bit of “more of the same” I thought he was doing well. It takes something like Time Out of Mind, though, to remind me of how much higher he could go. Dylan seems to like the songs from this album. All of these songs are played frequently now, which is something that hasn’t been the case since the 1970s. Generally Dylan will only use a few songs from any new album in his sets, but on this one he has played most of the songs hundreds of times. It seems clear that this album was the start of something new for him. Because it arrived in stores just after his first major health scare – chest pains in May had led to the cancellation of his European tour. The album was widely reviewed as Dylan coming to terms with his own mortality, even though it was recorded before he fell ill. I think at the time it was feared that it might be the last major Dylan project, although, of course, it was far from that. It really is the best Dylan thing in months. Certainly the best album since Infidels, maybe the best since Desire. It might even be a top five contender. I’m not ready to turn the page into 1998 at midnight!